Signed by Australia, New Zealand and the United States, the ANZUS treaty recognised that an armed attack in the Pacific area on one member would endanger the peace and safety of the others. The signatories pledged to ‘act to meet the common danger’. New Zealand’s confidence in Britain’s ability to protect the far-flung parts of its empire had been seriously undermined by the British surrender to the Japanese at Singapore in February 1942. A vulnerable New Zealand began to look elsewhere for its security. In 1945 this country was one of 51 nations to sign the United Nations Charter, pledging its support for the principle of collective security. New Zealand also sought a powerful ally capable of filling Britain’s shoes. By then the United States was the dominant Pacific power. After the war the Americans wanted Japan to remain strong as a barrier to the spread of communism in East Asia. New Zealand and Australia worried that a resurgent Japan could again threaten the region. 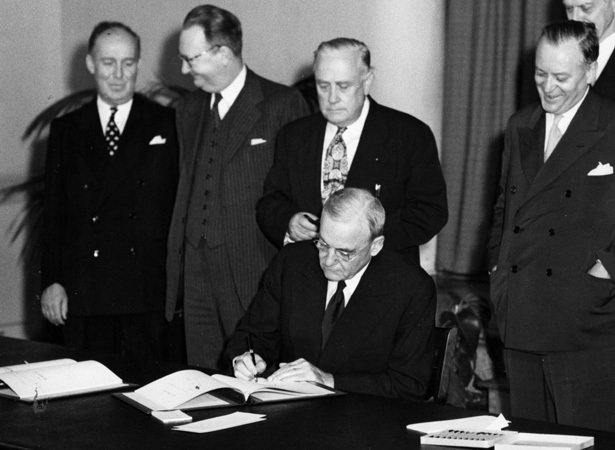 The ANZUS treaty was signed in 1951 to reassure the two countries that they would be protected and bolster their support for the anti-communist cause. The parties agreed to maintain and develop the military resources needed to resist an attack, and to consult the others if their security was threatened in the Pacific. ANZUS remained operative until the nuclear ships row of the mid-1980s. When the Labour government announced its decision to ban ships that were nuclear-powered or potentially nuclear-armed, New Zealand was effectively frozen out of ANZUS by the Americans. While there was a gradual thawing of bilateral relations in the early 21st century, the treaty relationship was not revived. We have 2 biographies, 4 articles, related to ANZUS treaty comes into force.